The E.F. Yerby (YCC) Conference Services provides a fee-based shuttle service to and from the Memphis Airport. You are asked to give a 3-day notice and pre-pay by Visa/MasterCard/Cash for all reservations. To book a reservation, please call (662) 915-5132 or email shuttle@olemiss.edu. Megabus offers service from Memphis to various cities. Fares vary, but can cost as little as $1. For more information, visit www.megabus.com. Greyhound bus line travels all over the United States. A Greyhound bus station is located near the Memphis Airport. A taxi from the airport to the bus station will be required. 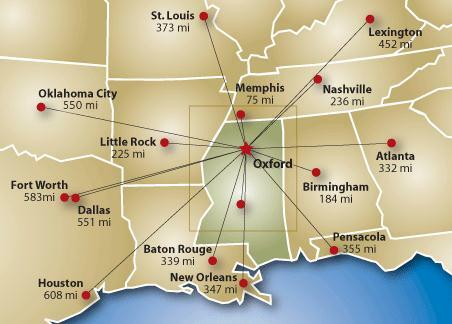 Please note the closest cities to Oxford Greyhound bus line stops is Grenada, MS or Tupelo, MS so a taxi from these locations to Oxford would be required. For more information on fares and schedules, visit www.greyhound.com. The Oxford University Transit (OUT) bus system now covers more of Oxford than ever. From Memphis, TN take I-55 south for 63 miles. Take the Batesville/Oxford exit off I-55. Merge into MS-6 and proceed east toward Oxford, MS for 26 miles. Once in Oxford, take the second exit marked Coliseum Drive onto campus. From Memphis, TN take US-78 for 52 miles. Exit US-78 at the Holly Springs/Oxford exit. From Holly Springs, take MS-7 south for 31 miles. Once in Oxford, take the 4th exit onto MS-6 and proceed west. Take the 3rd exit marked Coliseum Drive onto campus. From Jackson, MS take I-55 North for 150 miles. Take the Batesville/Oxford exit off I-55. Proceed east on MS-6 toward Oxford, MS for 26 miles. Once in Oxford, take the second exit marked Coliseum drive onto campus. From Tupelo, MS take MS-6 west for 52 miles. Once in Oxford, take the 6th exit marked Coliseum Drive onto campus.